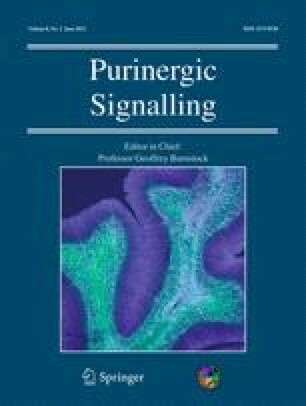 It has recently been shown that adenosine-5′-triphosphate (ATP) is released together with glutamate from sensory axons in the olfactory bulb, where it stimulates calcium signaling in glial cells, while responses in identified neurons to ATP have not been recorded in the olfactory bulb yet. We used photolysis of caged ATP to elicit a rapid rise in ATP and measured whole-cell current responses in mitral cells, the output neurons of the olfactory bulb, in acute mouse brain slices. 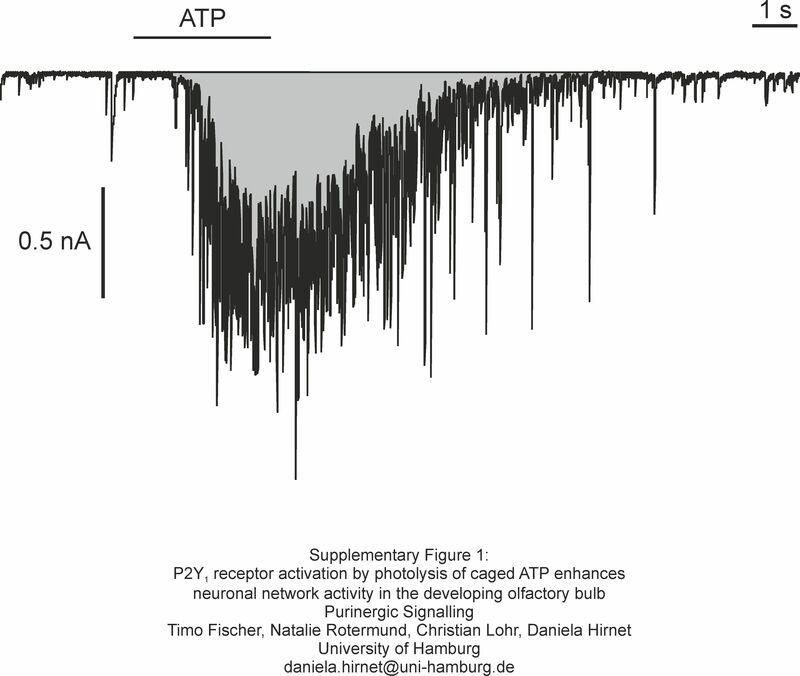 Wide-field photolysis of caged ATP evoked an increase in synaptic inputs in mitral cells, indicating an ATP-dependent increase in network activity. The increase in synaptic activity was accompanied by calcium transients in the dendritic tuft of the mitral cell, as measured by confocal calcium imaging. The stimulating effect of ATP on the network activity could be mimicked by photo release of caged adenosine 5′-diphosphate, and was inhibited by the P2Y1 receptor antagonist MRS 2179. Local photolysis of caged ATP in the glomerulus innervated by the dendritic tuft of the recorded mitral cell elicited currents similar to those evoked by wide-field illumination. 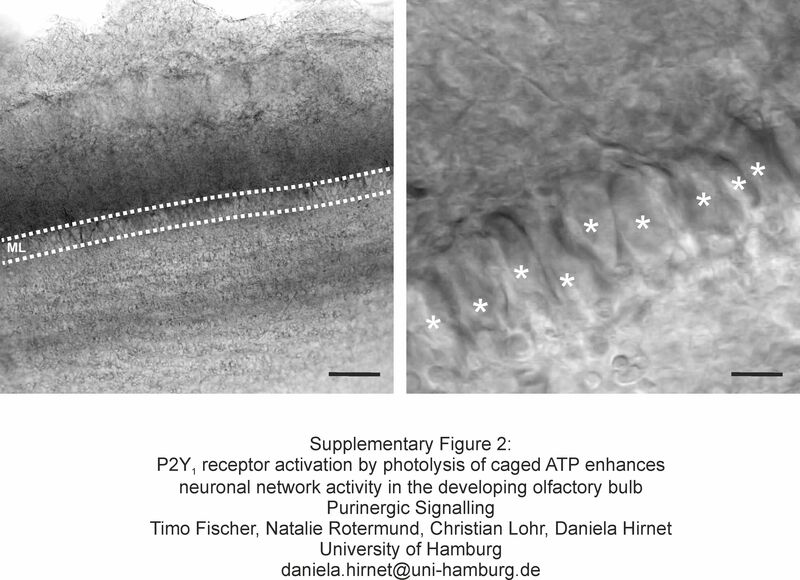 The results indicate that activation of P2Y1 receptors in the glomerulus can stimulate network activity in the olfactory bulb. Timo Fischer and Natalie Rotermund contributed equally to the study. The online version of this article (doi: 10.1007/s11302-011-9286-z) contains supplementary material, which is available to authorized users. Supported by the Deutsche Forschungsgemeinschaft (LO 779/6).